Working as a Sheffield wedding photographer is fantastic as the Peak District is on the doorstep so heading out there to photograph a wedding is fabulous. Emily & Elliott were married in the height of summer on a sunny Saturday – Emily was getting ready with her bridesmaids in a cottage in the farm where her parents live in the heart of the Peaks near Tideswell – the reception was held there too in a marquee with the stunning grounds surrounding them. Emily looked amazing in her silk gown – so stunning – her Dad waited patiently outside for the grand entrance and he was blown away! The ceremony was held in St John the Baptist Church in Tideswell where Elliott was waiting with his groomsmen – love a military wedding – a guard of honor is something special when you come out of the church! After a liberal coating of confetti guests headed to the reception passing the military roadblock before we could get to the reception! I loved the marquee layout – they managed to erect the marquee over some trees in the grounds keeping them inside which looked amazing. Guests helped themselves to drinks and an ice cream bar whilst we took some photos in the stunning grounds – there was even a swing for the bride to have a go on! The speeches which followed the meal were great and then it was time for the cake cutting with a sword before dancing the night away. A fantastic countryside wedding day – such a great couple – congratulations!! 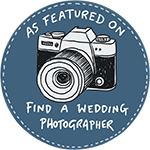 Helen & Paul are Sheffield wedding photographers – we also work in the Peak District and all over Yorkshire. We are based in the Lake District and love to photograph weddings in Cumbria. Contact us to see if we have your date available!